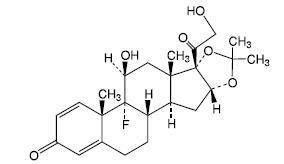 Each gram of Triamcinolone Acetonide Cream USP, 0.1% contains 1 mg Triamcinolone Acetonide in a cream base consisting of cetyl alcohol, cetyl esters wax, glyceryl monostearate, isopropyl palmitate, polysorbate-60, polysorbate-80, propylene glycol and purified water. Systemic absorption of topical corticosteroids has produced reversible hypothalamic-pituitary adrenal (HPA) axis suppression, manifestations of Cushing's syndrome, hyperglycemia, and glucosuria in some patients. Therefore, patients receiving a large dose of a potent topical steroid applied to a large surface area or under an occlusive dressing should be evaluated periodically for evidence of HPA axis suppression by using the urinary free cortisol and ACTH stimulation tests, and for impairment of thermal homeostasis. If HPA axis suppression or elevation of the body temperature occurs, an attempt should be made to withdraw the drug, to reduce the frequency of application, substitute a less potent steroid, or use a sequential approach when utilizing the occlusive technique. Recovery of HPA axis function and thermal homeostasis are generally prompt and complete upon discontinuation of the drug. Infrequently, signs and symptoms of steroid withdrawal may occur, requiring supplemental systemic corticosteroids. Occasionally, a patient may develop a sensitivity reaction to a particular occlusive dressing material or adhesive and a substitute material may be necessary. These preparations are not for ophthalmic use. Hypothalamic-pituitary-adrenal (HPA) axis suppression, Cushing's syndrome, and intracranial hypertension have been reported in pediatric patients receiving topical corticosteroids. Manifestations of adrenal suppression in pediatric patients include linear growth retardation, delayed weight gain, low plasma cortisol levels, and absence of response to ACTH stimulation. Manifestations of intracranial hypertension include bulging fontanelles, headaches, and bilateral papilledema. The following local adverse reactions are reported infrequently with topical corticosteroids, but may occur more frequently with the use of occlusive dressings (reactions are listed in an approximate decreasing order of occurrence): burning, itching, irritation, dryness, folliculitis, hypertrichosis, acneiform eruptions, hypopigmentation, perioral dermatitis, allergic contact dermatitis, maceration of the skin, secondary infection, skin atrophy, striae, and miliaria. Apply to affected area two or three times daily. Rub in gently. 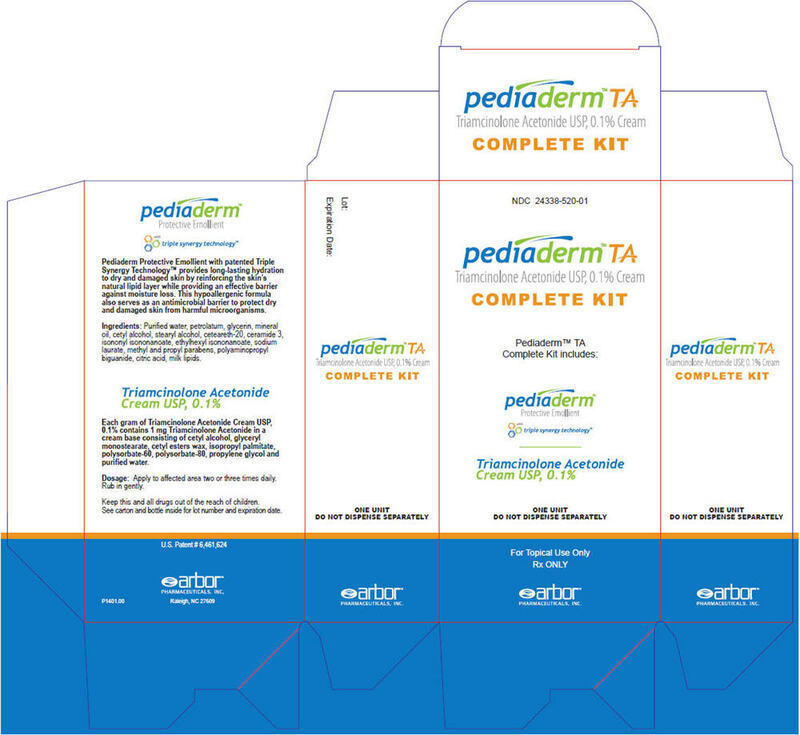 Occlusive dressings may be used for the management of psoriasis or other recalcitrant conditions. Gently rub a small amount of cream into the lesion until it disappears. Reapply the preparation leaving a thin coating on the lesion, cover with a pliable nonporous film, and seal the edges. If needed, additional moisture may be provided by covering the lesion with a dampened clean cotton cloth before the nonporous film is applied or by briefly wetting the affected area with water immediately prior to applying the medication. The frequency of changing dressings is best determined on an individual basis. It may be convenient to apply triamcinolone acetonide cream under an occlusive dressing in the evening and to remove the dressing in the morning (i.e., 12-hour occlusion). When utilizing the 12-hour occlusion regimen, additional cream should be applied, without occlusion, during the day. Reapplication is essential at each dressing change. If an infection develops, the use of occlusive dressings should be discontinued and appropriate antimicrobial therapy instituted. Triamcinolone Acetonide Cream USP, 0.1% in 30 g (NDC 24338-416-30) tube.